On our last day in Oysterville we decided to stop at Oysterville Sea Farms to pick up the obligatory jar of oysters and some amazing shortbread studded with dried cranberries. The shop was small but packed with delicious seafood and dried goods from around the Long Beach Peninsula. The rest of the afternoon we spent hiking around the salt marshes on Willapa Bay. We were the only ones out there and it was eerie and oppressively quiet except for the chirping of crickets and the dim buzz of the dragonflies. The day was oddly muggy and the air was dank and stagnant. We wound our way along the spongy mud trail through the dead and decaying grasses, trying our best to avoid all of the snakes. The highlight of our walk was when we spotted seabeans. I’d never seabeans in the wild and I was slightly unnerved to see where they came from. We harvested several handfuls and left the marsh in search of crab—with the idea of recreating Rover’s crab bisque. On the way out of town, we drove through Nahcotta and stopped at Willapa Bay Shellfish for two, beautiful, live crabs. Unfortunately, after the long drive back to Seattle, I forgot my seabeans in the car and ended up with just a crab. 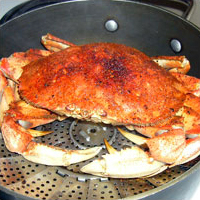 I didn’t have the proper ingredients handy for the Asian dipping sauce, so I decided to steam my crab with a coating of Survival Spice. I melted butter for the crab, but I was craving something more interesting. I pulled out the container of Survival Spice again and started using it like a dry dip. It may seem like an odd pairing, but I really enjoyed the assertively sweet and spicy flavors with the crab. Mmmmm, I love crab. The picture looks awesome! I’ve been making “Survival Butter” for crab lately. Great combo, I think (in all modesty, believe me, I’m really brutal when something doesn’t work) and it’s a really efficient use of butter and spice, too. PC – Survival Butter?! Love it! I’m so bummed you forgot the seabeans! I’ve never run into them in the “wild” or maybe I just didn’t know what they were before – seems like they’ve suddenly come into their own and are showing up all over town! Yeah, It’s too bad I forgot them—they were really crisp and good. So, whenever you’re in a salty, marshy, beach area, look down. They’re all over the place… almost like weeds! Survival spice on crab? Haha. I’ve got to try that out Meg. Great post! Thanks Simon, the crab was surprisingly good! Fresh steamed crab, that is the life. Sounds like a wonderful wedding! How fun!